Since Coca-Cola is seen as a cool brand by youngsters, they associate it with the big metropoles in this world and especially New York. COCA-COLA CITY is about the dream of living the cool urban lifestyle. It goes hand in hand with the current look of Coca-Cola's universe and the latest evolution in fashion. 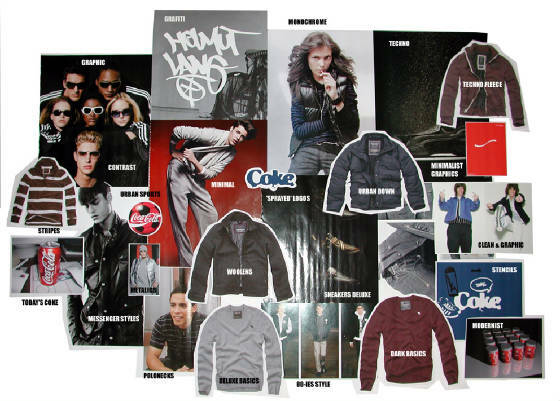 Brands like H&M, Speedo and Adidas are hiring big name designers to meet the public's demand for casual clothes with the same design qualities as the collections they see on the catwalks. The result is a new, minimalist kind of quality sportswear. Here we emphasize on an equally sober silhouette in mainly dark colours. Black, navy, dark red and gray look modern and urban as a total look or in monochrome layers. The garments themselves are extremely basic, with a trendy 80-ies feeling, and made out of quality fabrics. Their somewhat severe look is surprisingly contrasting with the handmade looking graphics that are inspired by current street art. Sprayed stencill and graffiti decorations are used in an exiting and unexpected way. As layers over graphic stripes and typography for example, always in a clean and minimal way. Coke was never as tasteful! These graphics could tell the story of urban sports but our preference goes out for everything related to mobile music in the big city (headphones etc). Because together with the comeback of black, music is fashion's next big thing!